YOGA SCHOOL FOR SERIOUS SPIRITUAL SEEKERS • INTERNATIONAL YOGA TEACHER CERTIFICATION AT LEVEL 200 - 500 - 800 - 900 HOURS. In 1993 Swami Santhiprasad established his School of Santhi Yoga School in Trivandrum, with the blessings of his Master Bhaskara Pillai Swamikal. The purpose was to enable people to look into themselves for solutions. To know oneself you have to look deep inside. The world is so hallucinating that we are grabbed fully by its experience. We are often very self-assured and believe we understand everything around us. Santhi challenge our beliefs and guide us to see things in a different way. A way in which you start seeing the world from your own self and go further to start seeing, feeling and knowing yourself a little bit more. By looking into the question "Who am I" you will start knowing yourself. You will learn to see all the subtle aspects of the mind and its relation with prana - the vital force. You will learn to understand yourself without the backing of any concepts what so ever. Since the start the School of Santhi Yoga School teach traditional Yoga for serious spiritual seekers on a regular basis. Just as envisaged in the traditional Indian Gurukula system, personal attention is ensured to each disciple and to facilitate this our sessions are conducted in small groups. Please make your reservation in time! Consider the time it will take to get an Indian Student Visa! Consider the time it will take to get an Indian Visa! I have committed myself to be available always for all of you and share what I have understood during the course of journey of my life, both in the Indian spiritual Yoga traditions and beyond, as a seeker if it is of help for you. What we need in this world is few individuals who could commit themselves to explore their own inner world! It is really difficult to find few of them. However, I commit myself to be available always! Consider the time it will take to get a Student Visa! One day I decided to change my life and do something for myself after rearing 4 children that had grown up and moved on with their own lives. So I packed up my house and flew to India to join the School of Santhi. but I was able to unlock deep spiritual gifts inside of me that I never knew existed. and see through the many veils of illusion that were inhibiting my spiritual growth. The day the course ended in India, I flew back to Australia and started immediately to teach. I was able to impart to all of my students the 'Spirit of Santhi'. The training made it possible for me to hold successful workshops on Yoga, Meditation and the Kundalini chakra system in Australia and Bali, Indonesia. 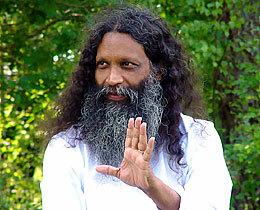 I hope everybody interested in Yoga will be able to meet him. 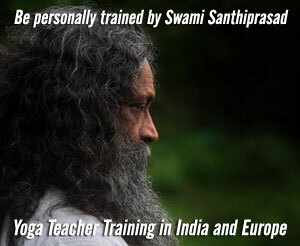 It is a blessing that Santhi with his long experience of Yoga still is around teaching classical Yoga. Santhi is always interesting to listen to. He is so fun. He is so experienced. He is so inspiring. I am delighted and most grateful to have completed my teacher training with the School of Santhi. and the delivery was superb. Absolutely everyone involved in the process from the master, visiting teachers, cooks, cleaners, to the supporting and administrative staff delivered their service with passion, enthusiasm, love and pure commitment. the School of Santhi once again reassured me of how you attract the experiences in your life that you need at the perfect moment. I was open to bringing a deeply inspiring adventure into my life and a deeply inspiring adventure is exactly what I received. Natural. Beautiful. In the mountains and forests. By a healing river. Trees. Birds. Close to the elements. What more could I ask for? clear and well structured; enlightening should I say. All the Santhi staff and helpers were open, transparent and friendly. The food was healthy and well balanced. with everyone always greeting you with a smile. The Yoga Asana practice pushed me to my limits and I really feel the difference! You are treated as a unique individual with the School of Santhi. It really felt like you were a part of a small family, and everyone was welcomed with fresh, open arms. to continue your own serious (but not too serious!) personalized journey to oneness. and showed me how truly deep it’s roots go, and how it relates to all aspects of life! It was truly a great introductory course that is packed to the brim with information and opportunities for growth, self healing, self realization and self-discovery. so that you can truly understand and relate to his words with your own life experiences, through the honest revealing of Santhi’s own life experiences and HIS own human journey! He was always open to questions and easily approachable. I am a changed man! I enjoyed my month in Kallar terribly. and even being home, I am frequently reminded of all I learned and experienced during my time at the School of Santhi. Prior to coming to the program, I had hoped to increase my knowledge related to yoga as well as an opportunity refine and improve my asanas. I also left with a very personal shift in perspective. I believe it has put me on a path to continue my spiritual journey. I am amazed that all this could have taken place in such a short amount of time. I would like take a minute to thank Swami Santhi, Kannan, Kumar and all the support staff who made the training and the time in Kallar so wonderful. Swami's method of presenting information was so engaging and came from a place of truth and it made it easy to be in long lectures every day. because I knew that the information he was giving us was such a special and unique gift and his delivery was so effortless and personal that it never felt like a class or a chore. and now that I am back in my regular practice, I am able to notice the vast improvement in my practice. how the body works and where the limit is for each individual. Having Kumar on site daily was also such a gift. I always felt taken care of and was so appreciative to have someone to go to if anything was needed. Words can not begin to express the gratitude that I felt towards the two of you. I began my spiritual journey 8 years ago and it has led me to School of Santhi! Little did I know that the knowledge, wisdom and kindness that you have been gracious enough to share with me this past month, is what I have been truly searching for. to create my own happiness and live my life the way I have always desired to. And two, that there is nothing I can do to ever repay you.